AIIMS Delhi recruitment process for filling up 551 staff nurses vacancy in Delhi. An official notification is out from AIIMS Recruitment department related to this Nursing Vacancy 2018. Those who are looking for staff Nurse Vacancy in AIIMS Delhi hospital can apply for these staff nursing jobs. Those ho are eligible for applying threes Government jobs for staff nurse vacancy can apply online through the AIIMS Delhi official website. Below in this article we share the different section which contains the full detail related to these Government jobs for nursing officers. Read the whole article carefully before applying these Government jobs. Below in this section we share the basic information related to this staff nurse vacancy in AIIMS hospital Delhi. Check the table below for detailed information. 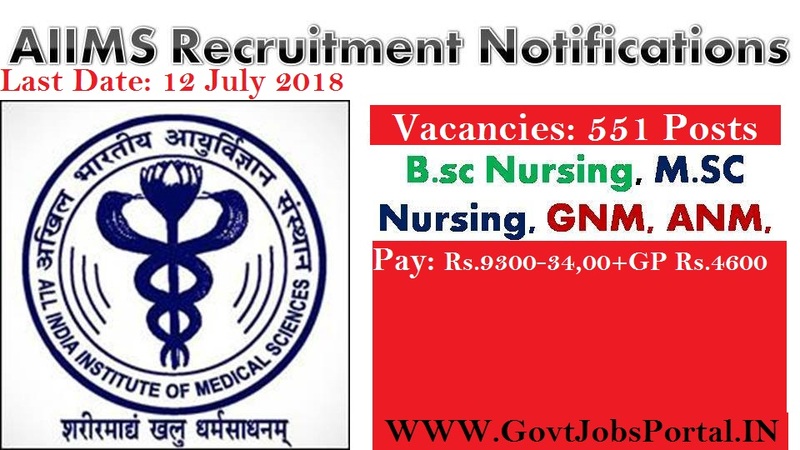 What is the Eligibility Criteria for applying this Staff Nurse Vacancy in AIIMS? B.Sc (Post-certificate)/Post Basic B. Sc. Nursing. Applicants who are wishing to apply this Staff Nurse vacancy must have age criteria in between following figures: “18 to 30 years”. What is the Application Fee for applying this AIIMS Nursing Vacancy? You can pay the fee in the following way: “Debit Card/Credit Card or Net Banking”. What is the Process for applying these Government jobs in Delhi? Applicants who are full filling all the eligibility criteria can apply for these staff Nurse Vacancies 2018. The process for applying these Government jobs in Delhi is online. Visits to AIIMS official website for online application form. You can also check below IMPORTANT LINK section for reference links. 13th June 2018 is the Starting Date. 12th July 2018 is the Last Date. 16 Sept. 2018 is the Exam Date.